Jen Rund began playing music at an early age, beginning with cello, piano, clarinet and guitar. At 15, Jen fell in love with the bass guitar and began her insatiable exploration into many different styles of music. 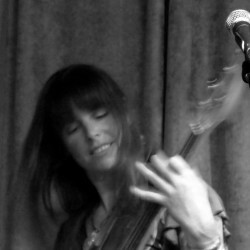 She has played, performed and recorded with a wide variety of people and ensembles, including: rock, pop, folk, Latin, jazz, R&B, funk, and blues bands, in venues ranging from clubs to festivals as well as children’s orchestras and choirs, music for children’s performances and musical theater. Always in pursuit of excellence, Jen is grateful to have had the opportunity to study with one of her greatest influences, bassist Victor Wooten (Bela Fleck and the Flecktones). She has studied as well as with bassists Kai Eckhardt ( John McLaughlin, Garage Mahal, Zeitgeist), and Luis Guerra (Patty Griffin, Bobby Shew, composer and award-winning producer). She has had great fun sharing the stage with many others, including: Karl Denson, Coco Montoya (Coco Montoya Blues Band); Brant Leeper (Coco Montoya); Mark Clark (Ottmar Leibert, Cat Stevens); Michael Chavez (Ottmar Leibert); John Kurzweg (producer Creed, Jewel); Larry Mitchell (Tracy Chapman); Barry Sless (David Nelson Band, Moonalice); Mark Karan (Ratdog, the Other Ones); Stu Allen (Phil Lesh and Friends, JGB); Pete Lavazzoli (JGB); Jason Crosby (Bob Weir, Phil Lesh & Friends, Robert Randolph); Michael Bluestein (Foreigner, Boz Scaggs); Lumanation; Cole Tate Band and Michael Pinkham (New Monsoon). Studio credits include: Loyal Rose – Loyal Rose (2013); Murali Levine – Enjoying a Life (Best Pop CD, 2011, NMMA); Road Trip – Trippin’ (2011); the Mercer Street Trio – Fireworks (2011); Gary Farmer and the Troublemakers – Troublemaker (2010); De Gusto – Violetta Parra: Canciones de Vida (2009). Deeply influenced by her many different experiences, Jen has a style all her own, and brings a passionate joy of playing to all of her musical endeavors.